Full-day excursion around Barcelona that will allow you to discover the history of the city while visiting some of the most important places in a comfortable and easy way. On this scheduled coach tour enjoy a full day discovering this unique city`s monumental highlights. Later we will take our bus to start with a panoramic tour around the rest of the city. We will pass through the elegant Passeig de Gracia Street, where there are located two of the most important Gaudi’s buildings (Casa Batllo and Casa Mila “la Pedrera”), the Triumph Arc, the Olympic Village and the Olympic Port, where we will do a brief stop. For the next part of the visit we will access to the Montjuic Mountain. We will also stop a few minutes in the Olympic stadium, the main scenery of the Olympic Games in the 1992. Later we will have the opportunity to enjoy the panoramic views of the city riding the aerial tramway (subject to the weather conditions). For the next part we will go to the Spanish Village (Poble Espanyol), one of the main attractions in Montjuic that consist in a synthesis of all the cultural variety in Spain. During the visit you will be given some free time to enjoy the different areas inspired in different Spanish regions, where your will find craft shops restaurants and bars. At the end, back to the bus, we will leave Montjuic and come back to the city centre passing through Espana square, where we will admire the magical fountains, the twin venetian towers, the MNAC and the Shopping centre Las Arenas, build in an old bullring. 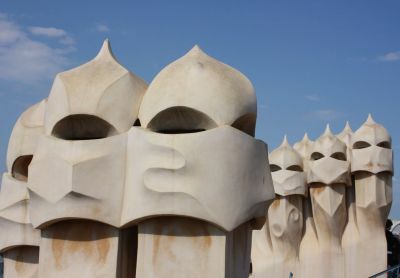 ARTISTIC: Barcelona is known as the capital of Modernism and the place where the famous architect Antoni Gaudí worked and lived. We take you to visit some of the most important works. The first part of the visit consists in a walking tour around the exterior of la Sagrada Familia, where we will discover its history and the symbolism hidden behind its ornamentation. Back to the bus, we will access to the upper part of Barcelona, where Park Güell is located with an incredible panoramic views of the city. The Park is one of the most emblematic works of Gaudí because he displayed all his creative talent with a naturalistic and organic style. The park has been declared World Heritage Site by the UNESCO. We will finish de tour with a nice walk through one of the most important streets in Barcelona, Passeig de Gracia, where apart from prestigious brand shops we can find some buildings in modernist style, among them Casa Mila “La Pedrera” and Casa Batllo. The tour will end up in front la Casa Batllo, only ten minutes walking distance from Catalunya Square. We begin in the Gothic Quarter visiting places like Las Ramblas, the cathedral square, The Cathedral, the Old Jewish Quarter, etc. Then we pass by Paseo de Gracia, where there are located two of Gaudi's buildings: Casa Batllo and Casa mila, also known as La Pedrera, as well as the Triunph Arc, the Olympic Village and Port etc. Next we will access to the Monjuic Mountain, the main scenery of the Olympic Games in 1992. Transportation in a fully equipped Motor Coach. Entrance Fees when with guide. Entrance fee to Spanish Village, to the Cathedral and Park Guell. Guided walking tour of Park Guell, guided tour outside of Sagrada Familia and Guided walking tour of Passeig de Gracia (Casa Mila “La Pedrera” and Casa Batllo). Casa Batllo and Casa Mila “La Pedrera” admission tickets. Since this tour involves some walking, we kindly advise you to use comfortable clothes and shoes. You have approximately 1 hours 15 min of free time for lunch (not included) between both parts of the excursions. From the end of January to the beginning of March (dates to be confirmed) the cable car doesn't work due to maintenance tasks, this service will be replaced by a tapas tasting at the Spanish Village. Please remember to request a change in the usual menu due to food intolerances or other reason when making your reservation and wait for the answer. The stop at the Olympic Stadium will take place unless there is any event that prevents access to the stadium.